Overflow: This setting is the default; the camera fills the card in Slot 1 (the top slot) and then switches to the second card. Raw Slot 1 – JPEG Slot 2: This setting relates to the Image Quality option. If you select one of the Raw (NEF) + JPEG settings, Raw files go on the card in Slot 1 and the JPEG files go on the card in Slot 2. 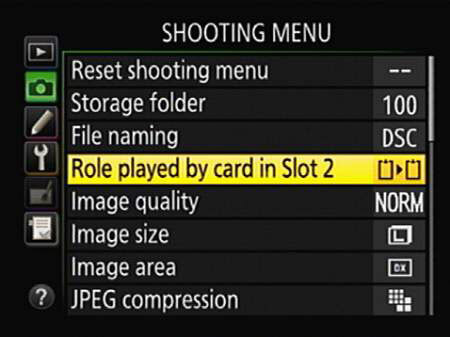 Make your wishes known via the Role Played by Card in Slot 2 option on the Shooting menu. Monitoring card use in the Information display: You can tell which secondary slot function is in force by looking at the Image Quality readout of the Information screen, highlighted on the left. The card symbols tell you what’s going where. If you see the same data for each card — for example, the word Raw appears in both cards — the Backup option is selected. And if the file type label appears in only one card, with the other card appearing empty, the Overflow option is selected. Determining how many more shots you can take: When you set the second card to the Backup or Raw/JPEG option, the shots remaining value is based on whichever card contains the least amount of free space. When either card is out of space, you can’t take any more pictures. For the Overflow option, the shots remaining value tells you how many pictures you can fit on the card in Slot 1 until you fill that card. Then it changes to indicate the space on the second card. Selecting a card to store movie files: Movie recording throws a wrench in the card configuration system. No matter what setting you chose for the Role Played by Card in Slot 2 menu option, movie files always go on the card in Slot 1 by default. To change the movie-storage setup, select Movie Settings on the Shooting menu and press OK. Then set the Destination option to Card 2. Copying pictures from one card to another: You can take this step by choosing the Copy Image(s) option on the Playback menu.